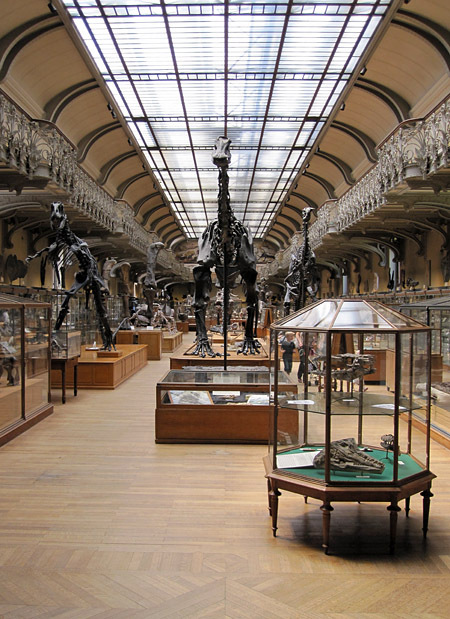 A couple of months ago, I posted photos of the modern vertebrates at the Galerie de paléontologie et d’anatomie comparée, the wonderful museum that opened for the 1900 Paris world’s fair, with a promise that there would be follow-up pieces on the paleontological exhibits. As it is now Christmas, this seemed like an appropriate time to open up the next section of this candy box. Paleontology occupies both the second level and a gallery/mezzanine above, so I thought I would just present the second level at the moment, particularly since the spaces approximately divide the vertebrate and invertebrate fossils. This replica skull of the Devonian arthrodire (fish) Dunkleosteus may look familiar to some of you. It is identical to casts on display in many other museums, including the Manitoba Museum. 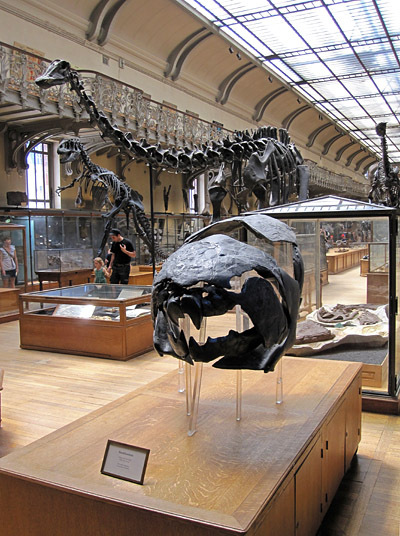 Most galleries of fossil land vertebrates are, let’s face it, dominated by the dinosaur skeletons. For some reason, this Paris museum is different. I’m sure that the dinosaurs are big, since some of them seem to be identical to casts that have looked very impressive in other settings. But they don’t look all that huge here. Their bulk does not impose upon or overwhelm you, and I’m sure that a lot of this comes down to the space in which they are exhibited. 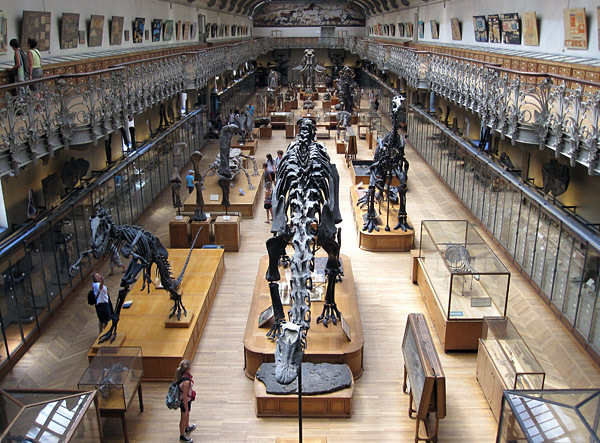 The gallery seems like an optical illusion to me: its proportions are such that it does not feel huge, and yet it clearly dwarfs the skeletons contained within. 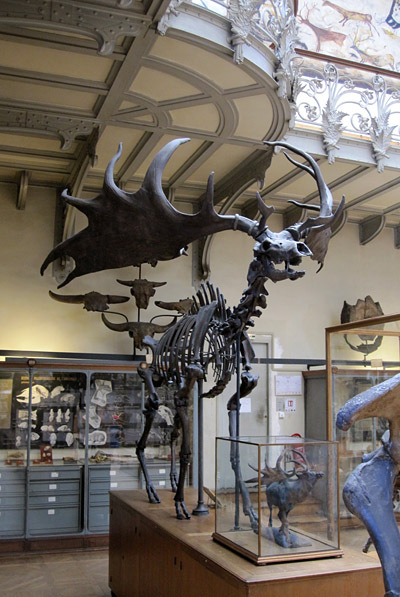 There is a second reason that the dinosaurs do not seem all that large: the Ice Age mammals are utterly stupendous. 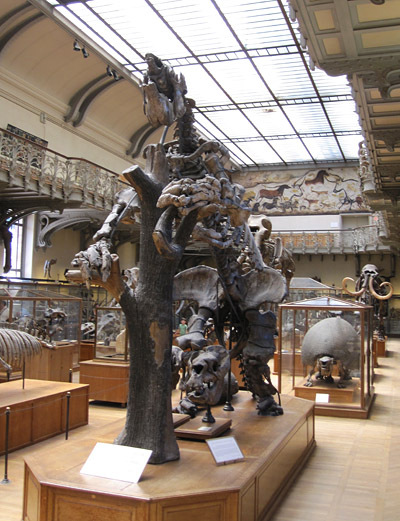 Some of the mammoths are huge, but other creatures such as the ground sloth are also monstrous. These exhibits provide a superb illustration of the Pleistocene megafauna that we sadly lost just a few thousand years ago. Many of the large skeletons in this Pleistocene area are genuine, making this the highlight of the gallery; the carnivores are jaw-droppingly wonderful. Mammoths always make me sad since we missed seeing live ones by a brief instant, geologically speaking. This mammoth towers over Juliana (who is far from short). Note the wonderful ironwork armature supporting the skeleton; it seems to have a Beaux Arts style that matches some of the railings. Those of us who are used to smaller galleries have a hard time appreciating the sheer scale of this case. These are large ice age carnivores: a hyaena, cave bears, a lion, and a wolf. 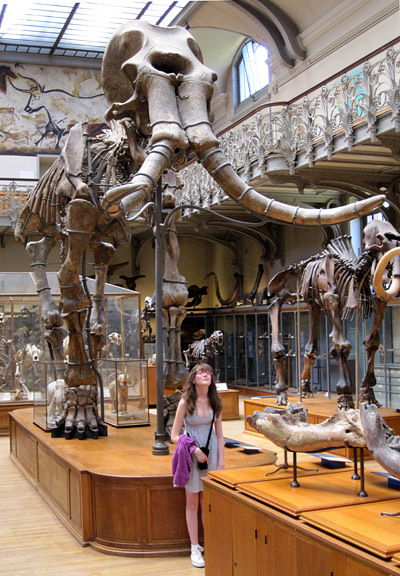 As in the zoological gallery, there are many other exhibits to see if you can manage to drag your eyes away from the large vertebrates in the middle of the room. 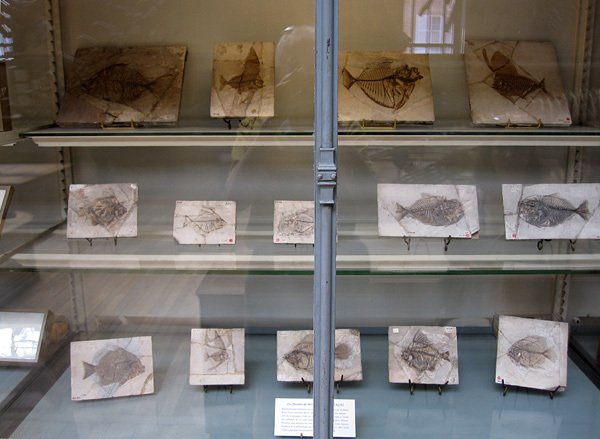 The areas below the mezzanine are filled with cases of smaller fossils, interpretation, and dioramas. Most of the exhibits in latter two categories must be described as “period pieces,” which seems only appropriate in a gallery of this relative antiquity. I hope that they never decide that these exhibits need to be modernized, because so much would be lost. A museum can tell us so much about the time period in which it was created! 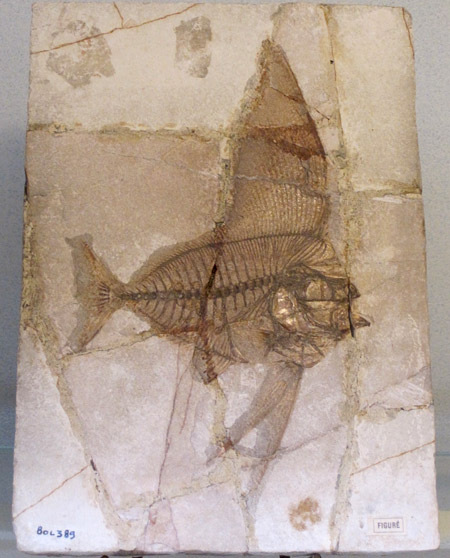 These fishes are from the famous Eocene Monte Bolca lagerstätte near Verona, Italy. 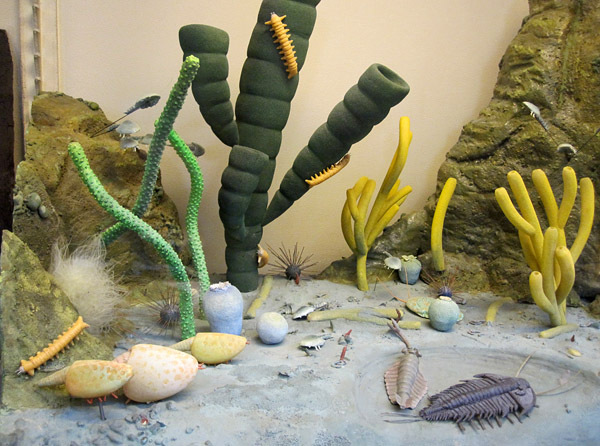 There are a number of charming dioramas, such as this creative interpretation of how the Cambrian creatures of the Burgess Shale might have looked. 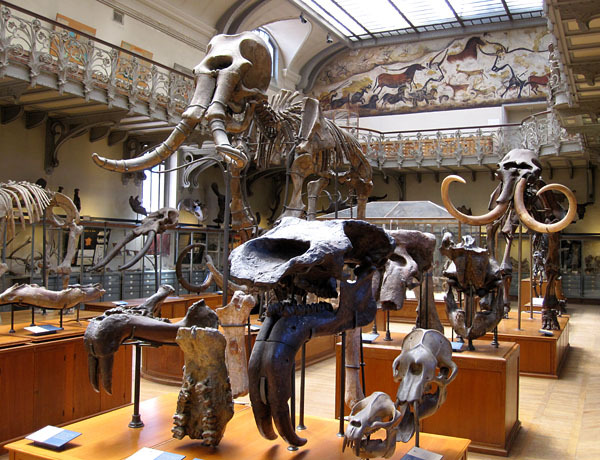 Since the dinosaurs do not overwhelm with their size, one can instead be absorbed by the wonderful variety of forms exhibited by the vertebrate skeletons on display here. Just stumbled across this blog. Wonderful post and wonderful pics. Parent of a precocious dino-obsessed twelve year old I can tell you you now that after he saw your awesome pics – he has just now added a further “summer vacation” destination to his wish list! Thank you. It is well worth the visit, if you can somehow manage to get to Paris! Thanks for featuring a museum with cases of collections. What an opportunity for lessons in comparative anatomy not to mention evolution. Thank you very much, Kate. 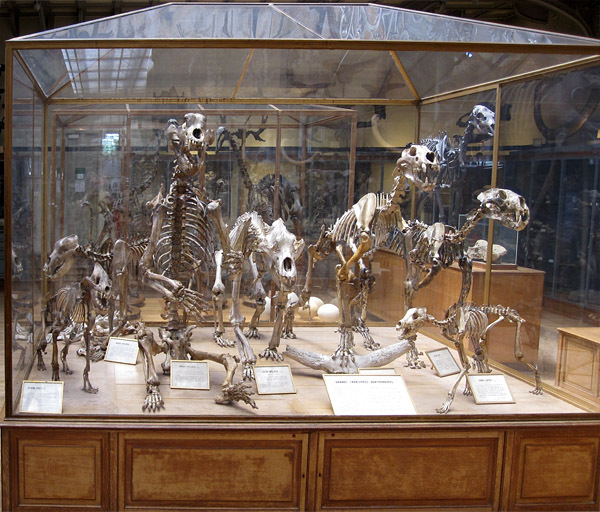 Yes, I think one of the best ways to demonstrate evolution is by showing comparative anatomy collections. It is completely old-fashioned and out of fashion, but I think it works better than any technological device. Indeed some of the dinosaur may seem not so large. It could be the surroundings of where they are placed. It could also be that that the skeletons could be made from castes; which after a while become smaller due to the caste process. Though indeed it is a great collection of photos. My next destination will be to France to see where all of these lovely pictures were taken, including some of those which are not posted here but ones I have seen though your other posts. Thanks! I think that this museum was featured in the 1962 film, La jetée.